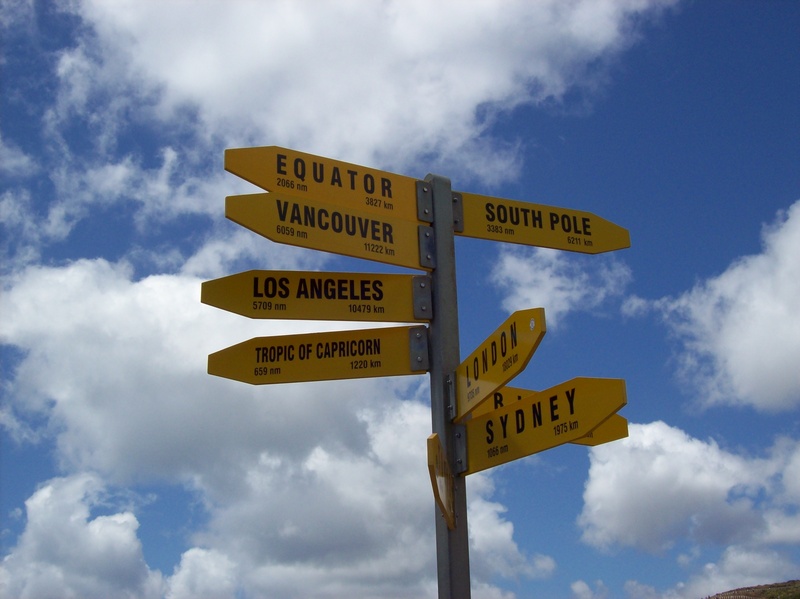 New Zealand consists of two main islands: the North Island and the South Island. My visit was exclusively to the North Island only. 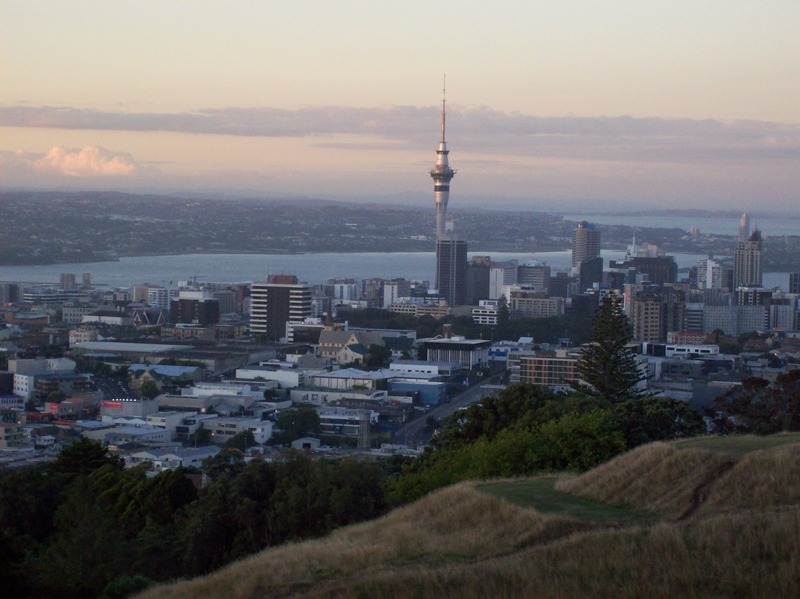 Auckland (Tāmaki) is the largest city in New Zealand, located on the North Island. 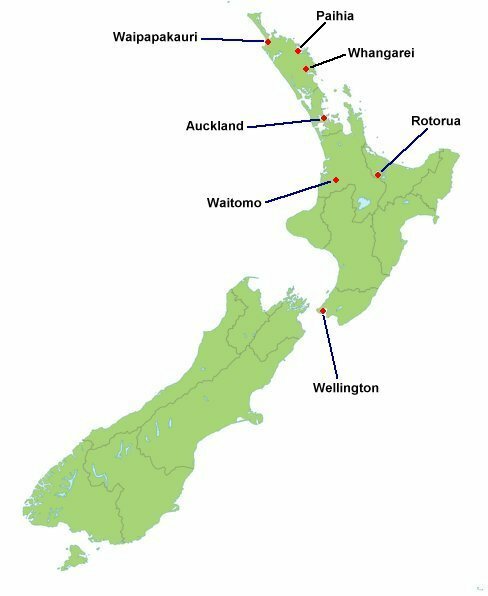 Early Māori settlers first occuppied the area in the 14th century, with European explorers arriving in the late 18th century. 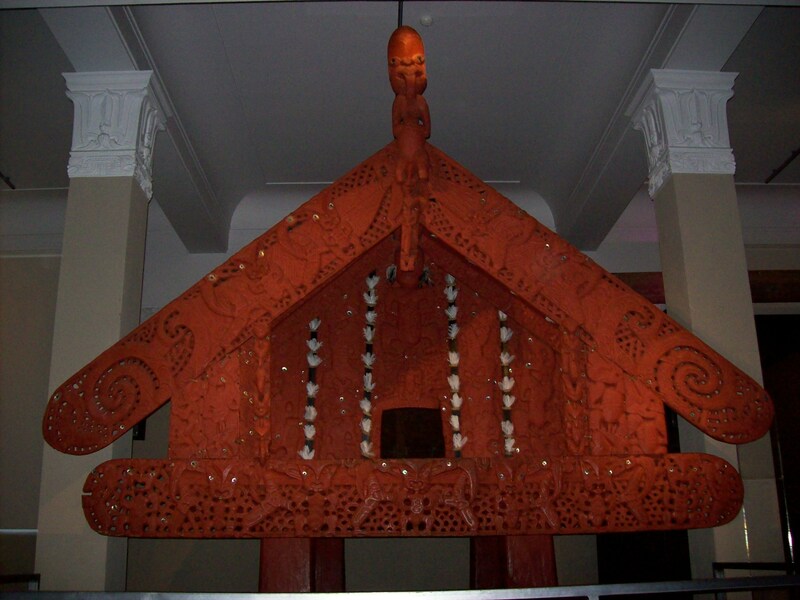 Auckland Museum - Its collections concentrate on New Zealand history (and especially the history of the Auckland Region), natural history, as well as military history. Here is a Pātaka, used as a food storehouse. 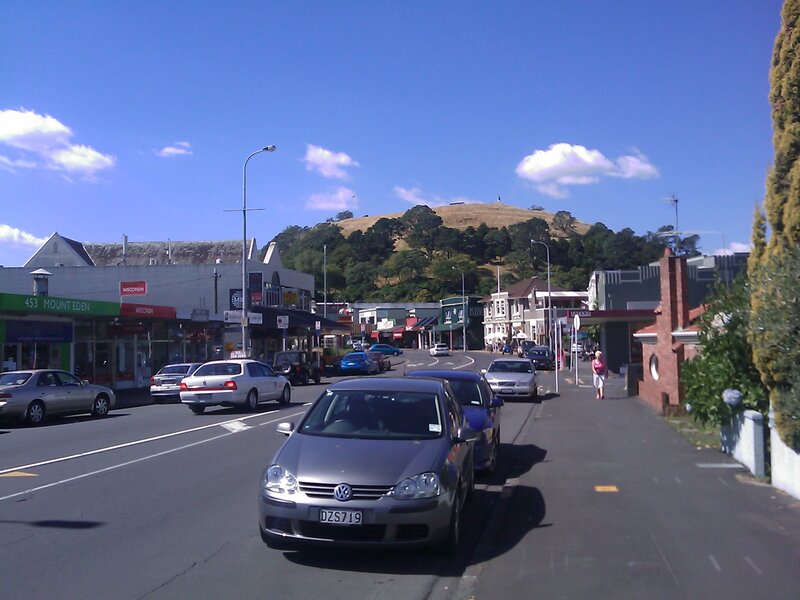 Mount Eden Village - Located north of Auckland and named after the extinct volcano, as seen in the background. 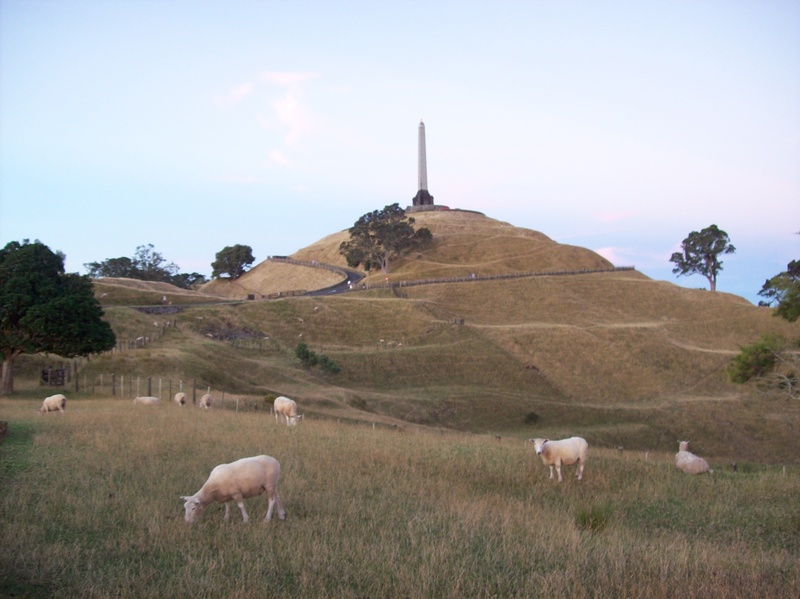 One Tree Hill (Maungakiekie) is an extinct volcano located north of Auckland. The obelisk is a symbol of biculturalism and respect between indigenous Maori and the white settlers. We visited the Waiotapu Geothermal Park. 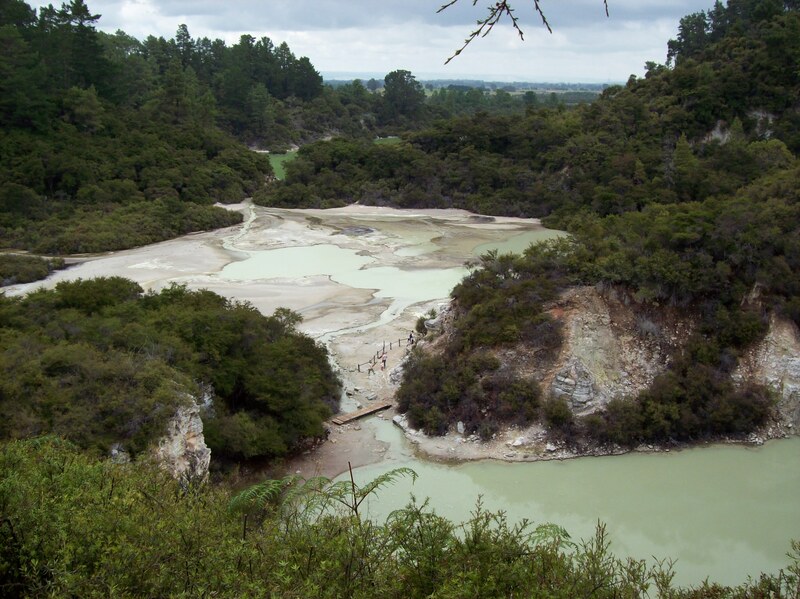 "Waiotapu", Māori for "sacred waters", hosts various geothermal features such as geysers, hot springs, and boiling / bubbling mud pools. 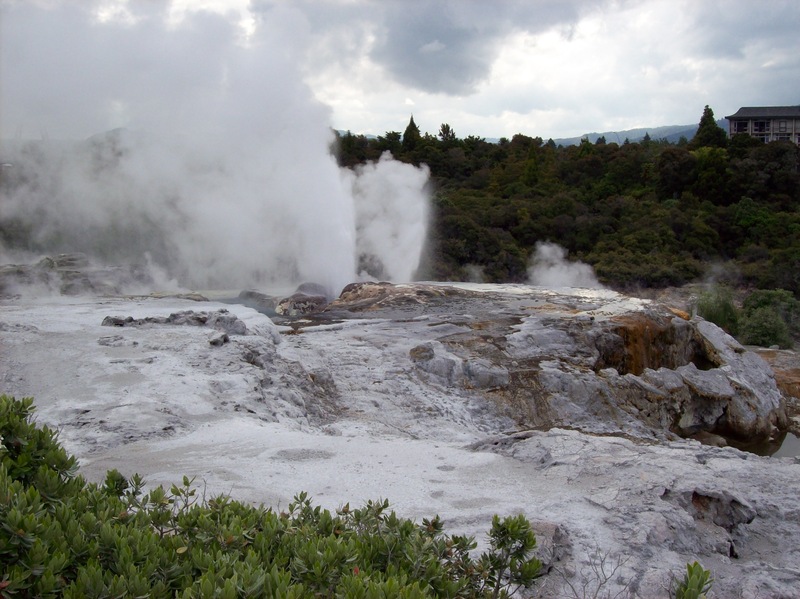 The Lady Knox Geyser, at Waiotapu Geothermal Park, is induced to erupt at 10:15 AM each day by pouring soap into the mouth of the geyser. It is named after Lady Constance Knox, the second daughter of Uchter Knox, 15th Governor of New Zealand. 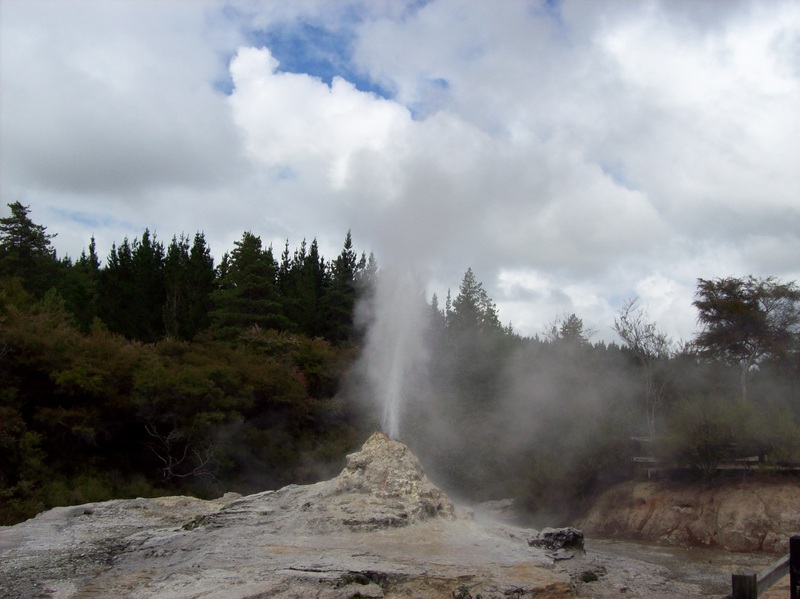 The Pohutu Geyser, at Te Puia, Rotorua. This geyser erupts up to twenty times a day, and the water ejected can reach heights of 30 meters. 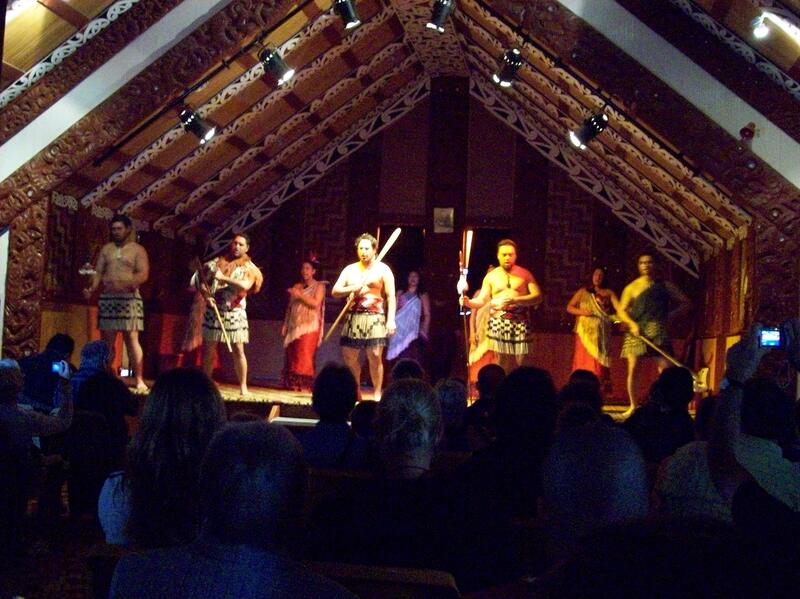 A Māori cultural performance, at Te Puia. The cultural meanings behind the singing, dancing and games are conveyed to the audience. Wellington is the capital of New Zealand. This is a view of the city at night, from Mount Victoria. Waitomo is famous for the Glowworm Caves. Here are the glowworms, in the light. Here are the glowworms, in the dark. It is an eery, greenish glow the worms emit. The Waitomo Glowworm Cave is your classic cave, with stalactites hanging from the ceiling and stalagmites protruding from the floor. 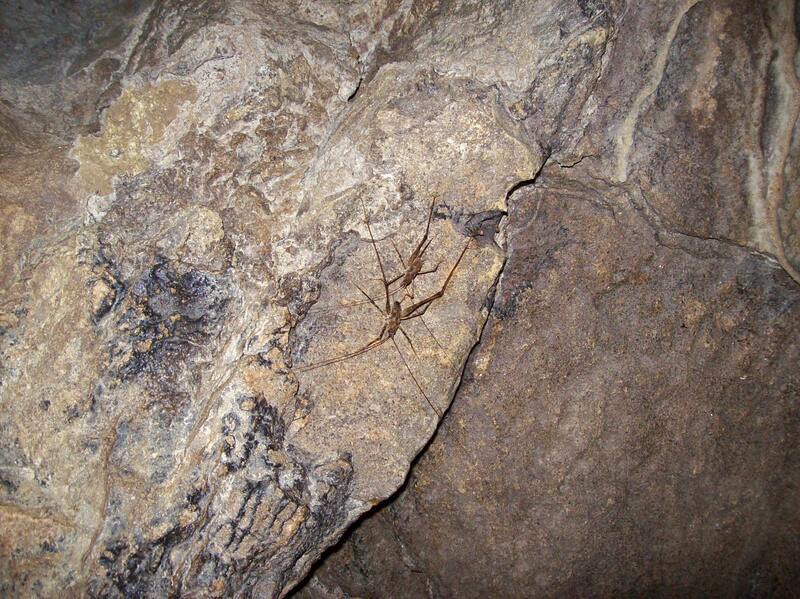 A large insect that can be found in the caves is the Cave Wētā. These large, flightless insects can jump up to 3 meters. Cave wētā are nocturnal scavengers, feeding on fungi, tree foliage, other invertebrates and animal remains. 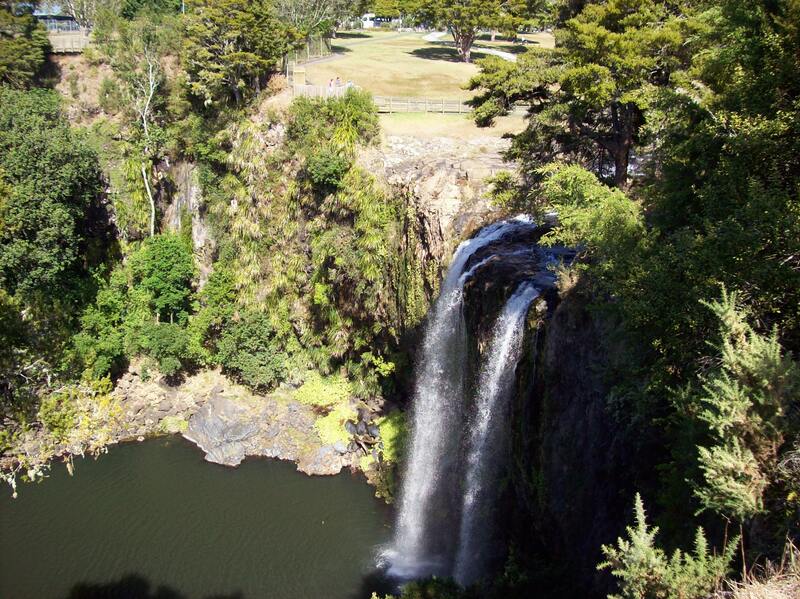 Here is a view from above Whangarei Falls, a 26 meter high curtain waterfall, located north of Whangarei City. Here I am at the bottom of Whangarei Falls. Paihia is the town from which a boat trip on the Bay of Islands is launched from. On the left is a view of the Hole in the Rock, in the Bay of Islands. Dolphins ply the waters of the Bay of Islands. Waipapakauri is located in the north of New Zealand, on the southern end of Ninety Mile Beach. The speed limit on entry to the beach is 100 km/hr! At nearby Ahipara, on the beach in Shipwreck Bay, is the buried shipwreck of the paddle steamer "The Favourite", which sunk in April of 1870. In the foreground is the crankshaft from the paddle steamer. Ninety Mile Beach is located on the west coast of the far north of the North Island. Cars are allowed to drive on the beach (it is officially a NZ public highway), and it is not uncommon for vehicles to get stuck and are claimed by the ocean. Here's our rental car on the beach. Note: despite the name, Ninety Mile Beach is really only 55 miles long .... NZ tall tales! Cape Reinga (Te Rerenga Wairua) is the northwesternmost tip of the Aupouri Peninsula, at the northern end of the North Island of New Zealand. It is here that the Pacific Ocean meets the Tasman Sea, where one can observe the tidal race between the two bodies of water. 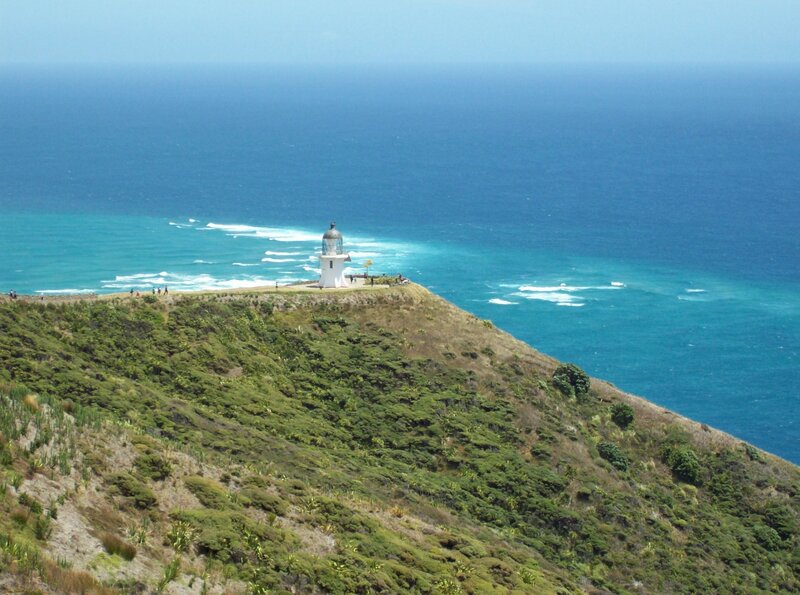 The Cape Reinga Lighthouse was built in 1941 to provide a navigation marker in the rough seas around the cape. Here, I am only 11,222 km from my home in Vancouver. Beautiful sunsets can be seen along Ninety Mile Beach; here is the sunset at Waipapakauri on 2010-01-29. Follow me on Twitter for updates on what I'm up to!